As the leaves change colour and the nights start to draw in, thoughts turn to the darker months ahead. Be ready to cut straight through the darkness along those muddy Fall trails with a custom Defender from Arkonik. A large choice of lighting configurations are available to suit your practical and aesthetic requirements. 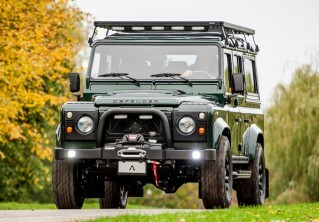 First up is deciding which headlights work best with your Defender’s defining front end. An urban style truck would be enhanced by DuoLux LEDs, which generate a precise beam pattern for optimum road illumination. For a classic look, our OEM style lamps come with upgraded Xenon bulbs. But if you are a looking for a balance of heritage style with modern technology and improved reliability, twin-cat LEDs are a perfect choice with ultra-bright output for maximum visibility. An A-bar is another defining feature should you choose to include one, and is a key area for extra lighting accessories. For the ultimate in practicality, Baja Designs XL80 LEDs produce a wide spread of light close to the vehicle and focused light further ahead for distance, blazing a trail through the darkest of off-road terrain. 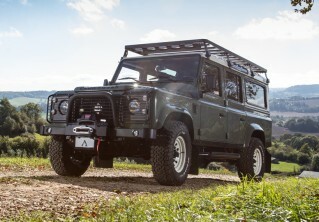 Distinctive HELLA spotlights are also available in either Xenon or LED; built to withstand rough conditions and complementing any urban or adventure style Defender. At Arkonik we are able to offer our clients full flexibility on the finest details; from the number and positioning of roof rack spotlights to a choice of either coloured or clear lenses for your side lamps. A work lamp can be mounted on the rear of your vehicle to aid visibility when setting up camp and loading up to leave in darkness. Our electrical team can also link this to your reversing light to further improve night-time visibility.